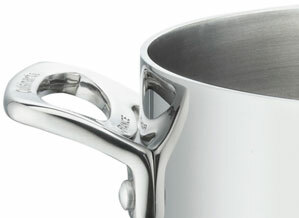 Cuisinart first produced cookware in France over 35 years ago. 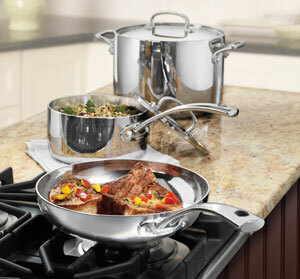 Today we honor that rich heritage with the Cuisinart French Classic Stainless Cookware Collection. Made in France, beautifully designed stainless steel tri-ply constructed pans with elegant handles reflect the quality of the world’s best kitchens. Now you can perform all of the classic cooking techniques in your own home, and create a lifetime of wonderful meals and memories with Cuisinart. One 2-quart saucepan w/ stainless steel cover, one 3-quart sauté pan w/ helper & stainless steel cover, one 4.5-quart Dutch oven w/ stainless steel cover, one 8-quart stockpot w/ stainless steel cover, one 8-inch open skillet, and one 10-inch open skillet. This multipurpose cookware set can be used on the stovetop, in the oven and under the broiler (oven-safe to 500 degree F), and is also freezer-safe, dishwasher-safe and induction-ready. The 10-piece set allows home cooks to create everything from multi-course Parisian-inspired feasts to everyday family meals. 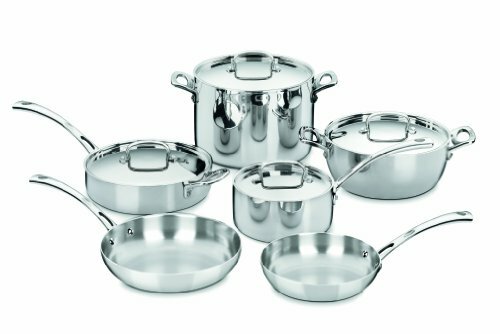 10-piece tri-ply stainless steel cookware set made in France to the highest standards of the world’s finest kitchens.